Five years ago this week we were on the road to Alaska from Georgia. Once we crossed the border into Canada, I spent every day looking for wildlife. There were many “WOW” wildlife sightings in both Canada and Alaska. I’ve been thinking about posting some of my favorite wildlife photos from the trip and today I finally got the boost I needed to put it all together. When my friend Ingrid at Live, Laugh RV posted that the theme for her very first Wednesday photo inspiration was wildlife, I immediately started going though the thousands of photos from the trip. If you would like to participate or see other posts inspired by Ingrid, click on over to Ingrid’s post Wandering Wednesday. Here are just a few of my favorite wildlife photos from our Canada and Alaska adventure. What an amazing ten years! Each marker on this map represents a place where we camped in our RV. Ten years ago, on July 1, 2006, we spent our first night in an RV park in Tampa, Florida. Two weeks later we left Georgia with no reservations anywhere and a bucket list of what we wanted to see. You can see highlights of that trip at Looking Back on our First RV Trip. Last year I posted a few of our most memorable experiences from our first nine years at Celebrating Nine Years of RVing. Many of our trips revolved around either visiting family or attending a special event such as a wedding or Titanium Rally. Sometimes we traveled just for the fun of seeing new places. No matter where we were going, we always took the long way around to get there. We discovered beauty in every state and province we visited. Sometimes the everyday things were the best. I love watching the changing landscape and seeing the many farms and ranches. We always enjoy seeing lighthouses. Seeing wildlife is always a treat. And of course we loved visiting many of our National Parks. Sometimes we enjoyed watching the sunset from our campsite. We did a few amazing hikes. Chilling by a camp fire is always fun. Now that we have ten years of RV’ing under our belt, our priorities have changed. Of course, we are ten years older and it is more difficult to make long trips. When we started our wandering, we only had two grandchildren. Now we have four and we want to spend as much time with them as we can. Going on long trips takes us away from them for too long. Our wandering days are not over. There are still many places we haven’t seen in and near our home state of Georgia so from now on we will travel a little closer to home. Today is Day 90 of our great adventure, Tuesday, August 13, 2013. It’s been a week since my last post from Tok, Alaska. Our journey from Tok to the Yukon border on the Alaska Highway was uneventful. When we stopped at the border crossing in the Yukon we handed the border agent our passports and his first question was “Are you heading home to Georgia?” He had not even opened our passports but he knew we were from Georgia when he saw our Georgia G license plate on the front of the truck! He is a fan of American college football and he and Henry talked football for a minute. Of course he asked the required questions and we were on our way. As soon as we got past customs the road was terrible. We waited for a pilot car to take us several miles through a construction zone and the rest of the way was full of potholes and frost heaves. It took almost four hours to travel the less than hundred miles from Beaver Creek to Burwash Landing, our stop for the night. Our campsite was right on the lake and Blondie even got to go swimming. I woke up in time to take some sunrise pictures before we continued on down the road. We enjoyed watching a Bald Eagle in our campground in Teslin, Yukon Territory before we turned south onto the Cassiar Highway into British Columbia. Although the Cassiar is paved, it is narrow, winding, and full of pot holes and frost heaves. The first part of the road had no lines painted on it and no shoulders. The going was slow but beautiful. Our one wildlife sighting was a red fox on the side of the road. After a restful night in Dease Lake, BC our next stop was Stewart, BC and Hyder, Alaska. To reach Stewart and Hyder we turned off of the Cassiar Highway onto the Glacier Highway for the forty mile drive down to Stewart and Hyder. It was one of the most beautiful drives we have been on and we saw two bears along the road. After setting up camp in Stewart, we drove the three miles into Hyder, Alaska. We drove through town where there are a few stores, most of them closed, a hotel, bar and restaurant, an RV park, and some houses. Just on the other side of Hyder we were in the Tongass National Forest where there is a nice bear viewing platform on Fish Creek. The salmon are running through the creek to spawn and bears are frequently seen going after the fish. As soon as we got there we saw a black bear in the creek. The next morning we went to the creek early to watch for bears at Fish Creek. We missed three grizzlies and a black bear that were there earlier. The most excitement we had was watching a wolf go after fish. After about two hours we decided to take the 17 mile drive on a gravel road to see Salmon Glacier. We reached an overlook where we looked down for a spectacular view of the glacier. After stopping again at the bear viewing platform with no sign of a bear we returned to the campground to get ready for the rest of our trip. Early the next morning we were on the road again. We stopped at an overlook on the way out of Stewart for a close look at Bear Glacier. We turned off of the Cassiar Highway onto the Yellowhead Highway. The road is good and we traveled through several towns before stopping in Houston for the night. We went out to a pizza restaurant for dinner and called it a day. The going is slow on most of the roads we have been on since we first got to Alberta in June. We have been averaging about 45 miles an hour most days so the going is slow. It’s even slower on some of the mountain roads. We are on roads now where we will be able to make some time. If all goes as planned we will be in Washington state on Thursday. Our original plan was to spend 3 nights in Valdez and then start heading back home. We liked it here so much we ended up spending 5 nights. We couldn’t pass up our last chance for fish and chips so we had lunch at Old Town Burgers. My halibut and chips were delicious and Henry enjoyed his fish tacos. We met a great group of folks on the boat yesterday who told us there was a mama bear with four cubs on the way to the fish hatchery. Of course we couldn’t pass up an opportunity to see a bear so we took a drive back to the hatchery. 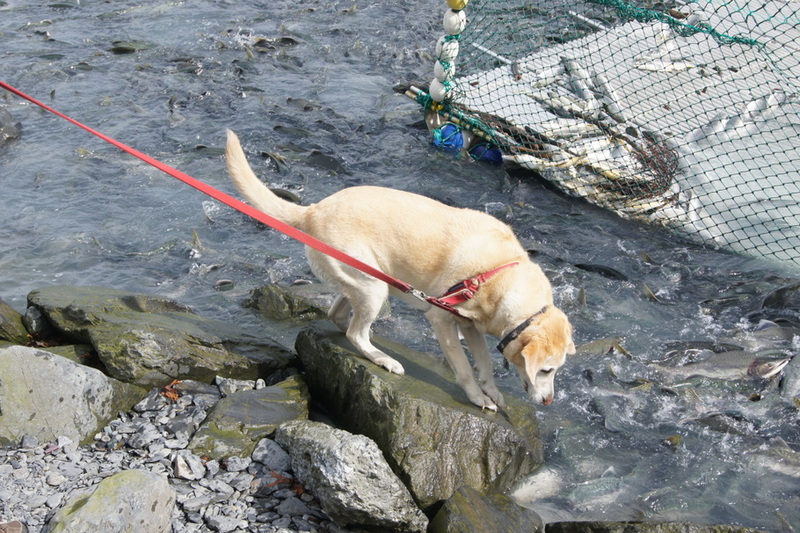 We took Blondie down to the water and she wasn’t sure what to make of the fish. As we drove back from the hatchery Henry spotted a black bear on our side of the road. We pulled over to the side of the road and watched the cub follow his mama back into the woods. With her cub safe and sound mama made several trips to retrieve dead fish from the creek bank to take back to the cubs. While this was all going on a Bald Eagle was preening on the top of one of the trees. After watching the bears for a long time we got ready to leave and saw a golden eagle fly overhead. It was a great day to end our stay in Valdez. We will now begin our journey back home with one more night in Alaska before entering Canada to head south. Day 38: Saturday, June 22, 2013. Haines, Alaska to Whitehorse, Yukon Territory. Pioneer RV Park, Site 55. 244 miles traveled. Blondie and I took one last walk around Haines before we got ready to leave. After one last look at our beautiful view and saying goodby to our friends in Haines, we continued on our journey to see the rest of Alaska. There were no eagles to be seen as we passed through the Eagle Preserve beside the Haines Highway. We went through Canadian Customs and entered British Columbia. When we spotted a black bear in a field of dandelions, Henry pulled over to the side of the road and backed up so I could get a few pictures. That was no easy feat towing our trailer! We finally saw a bear! From British Columbia we entered the Yukon and spent the night in Whitehorse. There was another Titanium in the park just a few spaces from us. We rarely see other Titaniums and try to meet the owners when we can. The owners of this one were from Ontario on their way to Alaska.